This book has come under fierce attack, though not on its merits. Rather, it has been attacked through an assault on the author. On account of my correspondence, however, I had some tangible evidence in support of the contention that the book represented Flew’s real positions. I produced this material in this blog post here which has gotten a lot of attention. While I wait for a reply from Mr. Carrier, I thought it high time to produce the actual letters which I quote and display (from a distance) in that blog entry. UPDATE: These Letters are now only available in an ebook. Kindle and Nook links Here. I didn’t produce this earlier out of deference to Mr. Flew, thinking that private correspondence ought generally be kept, well, private. I don’t think he would mind now. If anyone should like to transcribe the letters below I should very much appreciate it. I will post their transcription if they do. I received 3 letters, only 2 of which are produced here. The third from him was merely a courtesy and contained no new information. The first image is the letter I sent to him. I deleted just a few places as it seemed proper- ie, contact info. Otherwise, I left the letters ‘as is’ for posterity’s sake. I don’t have my second letter to Flew handy and do not recall precisely what I wrote. However, one can guess a bit from his reply, which is below. At 1:29 the interviewer of Flew explains he could not broadcast the interview he had done with Flew, because Flew could not understand the questions and was incoherent. That unbroadcastable interview was done in 2005. There is only one issue here: did his book reflect his actual positions or not? You guys keep attacking his mental state as though if it were shown that he had deteriorated significantly you could consider his new position as ‘ill-gotten’ and put another mark in the ‘Christian apologists are evil’ column. However, it is abundantly clear to any fair minded and objective- and kind- person that the book does reflect his real views. 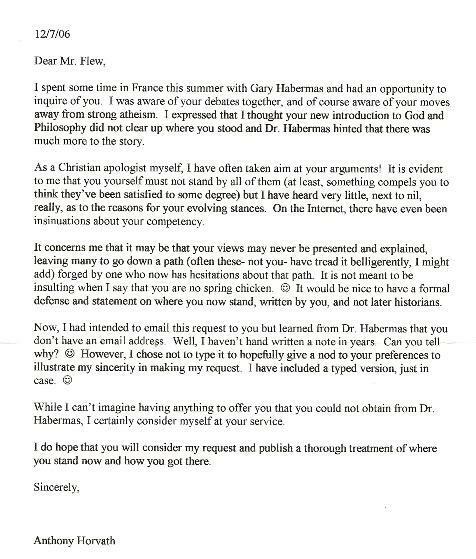 Such a reader may wish to take a look at this interview from 2004: http://www.biola.edu/antonyflew/index.cfm Dr. Flew is eminently coherent and readers of his last book will easily see numerous similar themes and points of contact. My letters demonstrate continued adherence to these views despite any deterioration. Besides, wouldn’t one expect that if those nasty Christian apologists really had their hand on the wheel that they would have just gone whole hog and in the final book presented Dr. Flew as one who had fully and finally become a Christian? But none of this matters to you. You are not nice people. You have no shame. You are the one manufacturing viewpoints and ignoring the relevant issues. I am glad that you popped onto my blog again to engage in indecencies. For all those people out there thinking that atheists occupy the moral high ground, ‘contributions’ like yours reveal otherwise.